Our vacation is officially over. And, I must admit, it’s good to be home! We had some really great food this past week, but I am looking forward to eating at home again. Just need to make sure we get to the store first thing tomorrow…our cupboards are bare! And, sadly, no photo this week. My camera and camera cord are still packed. And I’m just too exhausted to dig them out! Okey dokey, time for you to share your menu for the week! Can’t wait to see what you have up your sleeves! Day 1: Take them to Disneyland and stay until 9:00 pm when the park closes. Children will fall asleep during the car ride back to the hotel. You will have to carry them into the room (look out, they’re heavier when sleeping!) but they’ll stay asleep during transport because they are so stinking tired. You will actually get to stay up later in your shared hotel room with your kids because they will sleep through anything (even television) at this point. Day 2: Take them swimming during the day. It doesn’t even have to be for very long. 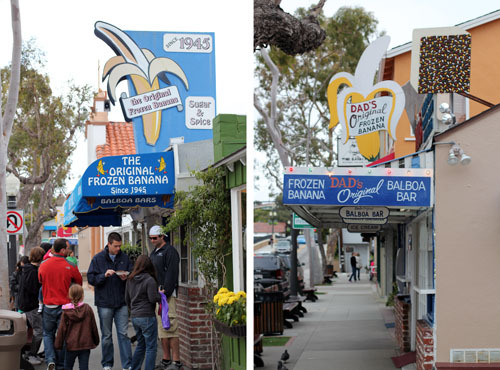 At around 5:00 pm, feed them ice cream on Balboa Island and then drive around for a while looking for dinner. They will once again fall asleep in the car. While the timing of their slumber will be a bit disappointing (i.e. right as you pull up to the Beachcomber Cafe, forcing you to give up and drive back to the hotel without any supper), they will be so exhausted from a week of vacation, no naps, and Disneyland fun, they will actually go to bed at 6:00 pm, leaving you to read books or watch episodes of Mad Men to your heart’s content! And that is all you have to do. Easy peasy. After a week of galavanting around Southern California, we are actually all feeling pretty exhausted, but all very happy. Yesterday was our big Disneyland day. It was simply magical. 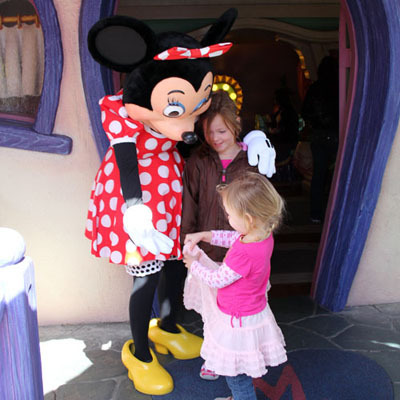 Disneyland is always a fun place, but experiencing it with your children is the best. What I was most impressed with this time around was the staff. Everyone we interacted with was so friendly, it was amazing. And the characters? They’re all going straight to heaven. They make each and every child feel special. And they do it without saying a word. Today we took it easy. A little swimming, a little eating, a little driving. And, apparently, a lot of sleeping. The girls really did fall asleep before 6:00 pm and I have a feeling will sleep all night no problem. For these last two nights of our trip we are staying at the Marriott in Newport Beach. We we were treated to a delicious buffet breakfast this morning, and I was lucky enough to get a massage at the Marriott’s Pure Blu Spa in the afternoon. In all honesty, our room is very small by any hotel standards, which is just not very practical for a family of four with 1 weeks’ worth of luggage. But the room is nice and the view is phenomenal. Can’t be beat. 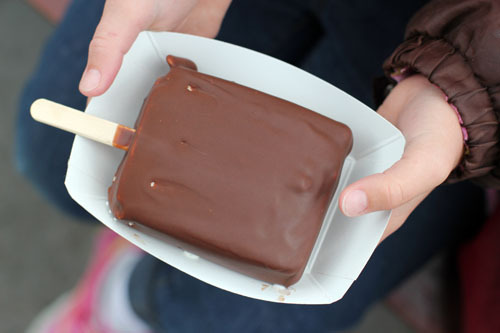 We made sure to get chocolate-dipped frozen bananas and balboa bars on Balboa Island, take the car on the tiny Balboa Island ferry (maybe a two-minute ride, but super fun) and grab some clam chowder at The Crab Cooker. The chowder was the best manhattan-style I think I’ve had – tomato-based but still creamy with great, fresh clams. 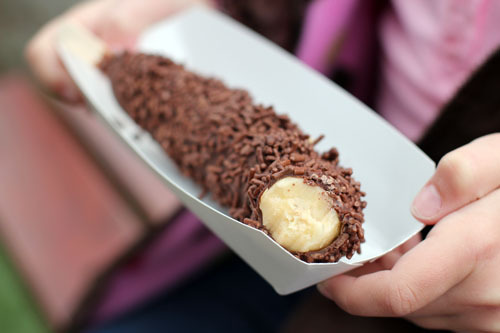 As for the chocolate-dipped frozen bananas…yum!!!! A question for those of you in the “know.” Which shop is the true original? Sugar ‘n Spice or Dad’s? They were just a few doors apart. We went with Sugar ‘n Spice because it said “the” original, and Dad’s just said “Dad’s original.” Anybody know the story about the two shops? Would love to hear it! Time for bed. Big day of driving tomorrow. Thanks for joining us on our adventures this week, culinary and otherwise! Legal mumbo jumbo: Disneyland provided us with admission tickets to the park, and the Marriott provided us with one free night of lodging. Thanks to both! Our two nights in Huntington Beach are already over! This week is going too FAST, people. I think we should have given ourselves twice as much time…too bad work and school have to get in the way, eh? 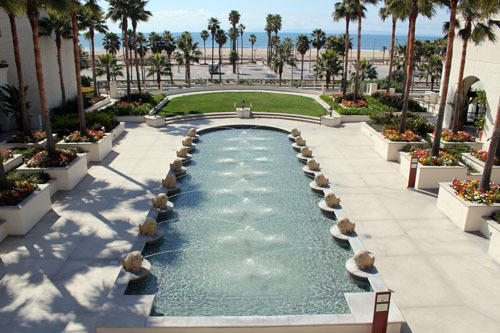 We were beyond lucky enough to get a chance to stay at the Hyatt Regency Huntington Beach. 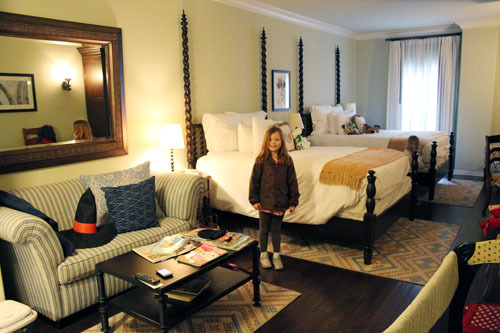 Okay, I thought I wanted to move into the Canary Hotel in Santa Barbara. Then we got to our room at the Hyatt. The PR woman who I’ve been working with pulled out ALL the stops. I am not exaggerating when I tell you that our suite was actually bigger than our apartment at home. And THIS was the view off of our GIGANTIC balcony. Needless to say, we thoroughly enjoyed ourselves…despite the fact Nate was staying in a hotel on the beach, surfboard at the ready, and there were NO waves, rendering surfing impossible. Total bummer. But the resort made up for it. The hotel was beautiful and the staff was fantastic. When we arrived Tuesday night, the executive chef for the hotel, Chris Savage, was waiting to cook dinner for us. Our dinner was prepared and served in a private dining room set aside just for us. I think this may have been one of the most fun, relaxing, delicious dinners I’ve ever had. The chef was wonderful, kind and interesting (not to mention busy…I can’t imagine doing his job! ), and the Hyatt folks were beyond nice and helpful. First we had a chicken tortilla soup, followed by a trio of salads, all of which were delicious. The bread served alongside was also great…I stole Anna’s leftover bread when she wasn’t looking. Yeah, I’m a good mom like that. 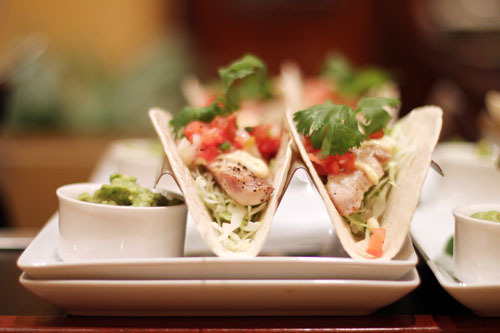 The main course was one of the hotel’s signature dishes – fish tacos with grilled mahi mahi. Oh my, these were some of the best fish tacos I’ve had. And I’ve had many. Dessert was strawberry shortcake, accompanied by a giant chocolate covered strawberry. The biscuit was still warm, the cream perfect, and the strawberries just the right amount of sweet. A few words on the resort. And I’m not just saying this because they paid for part of our stay. This place was SO MUCH FUN. On our full day at the resort, we spent the morning at the beach – the most fun the girls have had yet on the trip, resulting in very sandy, very wet clothes and very tired but very happy little girls. The afternoon was spent at the pool. 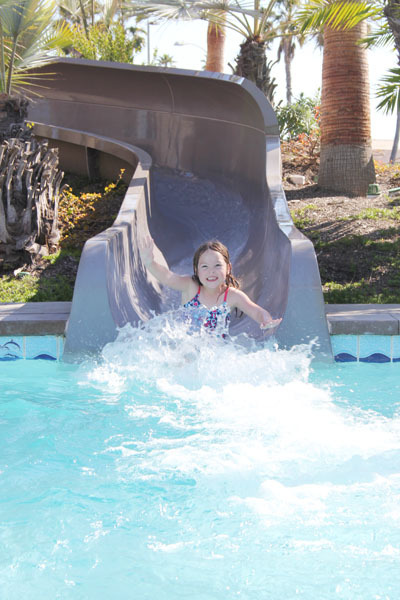 They have these totally fun water slides that Cate could not get enough of. We ordered room service poolside (money well spent, by the way)…the food was super tasty and we got to stay out by the pool in the beautiful weather. We seriously did not want to leave. And we’re already trying to figure out when we can get back. We are walking away from our time at the Hyatt in Huntington Beach with really wonderful memories. This may sound cheesy, but when we were sitting out in the beautiful weather eating lunch at the pool, I looked at my family and felt an overwhelming sense of joy and gratitude. Those are the moments that you never forget. On to Newport Beach and Disneyland! Yesterday marked the end of our time in Santa Barbara. And what a good time it was! 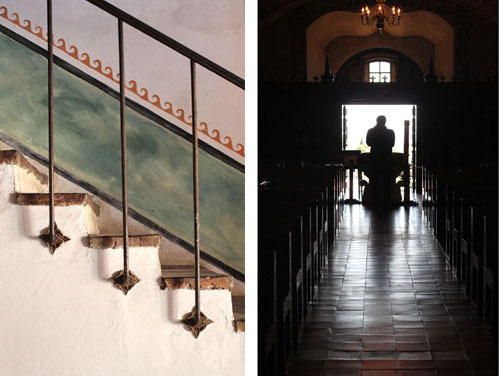 For our last morning, we drove around town a bit (drooling over houses as we went) and then visited the Santa Barbara Mission, also known as the Queen of the California Missions. The buildings, gardens, church and cemetery were all beautiful. And the view was unbelievable. The door at the back of the chapel looks straight out to the ocean. It certainly puts one in a meditative mood. For our last meal we had lunch at the Wine Cask. This was by far the fanciest restaurant of the three we tried – the tables and decor were lovely. And they had this wicked cool wall of wine bottles…we were all mesmerized by it. Our food was great and Nate had his favorite food from the trip…a Croque Madame. The bourbon caramel bread pudding was downright divine. Big thanks to the Santa Barbara Visitor’s Bureau for helping us plan such a fabulous trip to their beautiful town! We can’t wait to return! Is there a more beautiful town in the United States than Santa Barbara? I’m really not sure there is. And I lived in San Diego for 7 years, so that’s saying something! The landscape is amazing, the coastline gorgeous, the weather lovely, the architecture stunning…I’m running out of adjectives, so I’m just going to stop there. We are loving it here and we only have half a day left. It went by far too quickly!! The Canary Hotel provided us with one free night and one night at a media rate. We could have stayed at another hotel for free both nights, but the call of the canary was too strong. We gave in. And I’m so glad we did. The hotel is in the heart of downtown Santa Barbara and is beautiful. Our room is beautifully decorated, with gorgeous dark wood floors. And there’s plenty of space, even with all our stuff and four people. And the rooftop? We could live there. 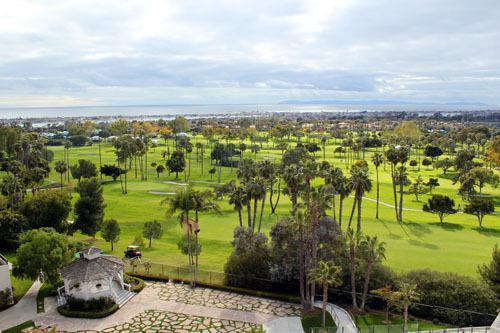 There’s a heated pool, hot tub, tons of great tables and chairs for hanging out, and a 360-degree view of Santa Barbara. Absolutely gorgeous at sundown. I’m so glad we splurged a little to stay here. We’ll never forget it! Yesterday we went to the Santa Barbara Zoo for half the day, aptly nicknamed the “Zoo with a View.” They weren’t kidding. The zoo is lovely, with great views of the ocean and the mountains. We at lunch on a beautiful lawn overlooking the twinkling waters of the Pacific Ocean. And it was a nice manageable zoo – the girls could walk the whole way, we saw all of their favorite animals, but it wasn’t overwhelmingly huge. It was a really fun time. Let’s talk food, shall we? The first night Olio’s Pizzeria treated us to dinner. Our waitress was telling us that the couple who owns Olio’s Pizzeria also owns the fancier restaurant next door called Olio e Limone. They opened up the pizzeria to provide a more casual option. It is a fun space and was bustling with people. When we arrived at 6:00, the restaurant was already full, and when we left at 8:00 it was packed with a line out the door. 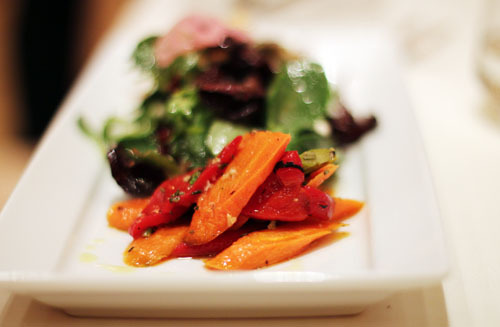 We had some really delicious food at Olio’s. 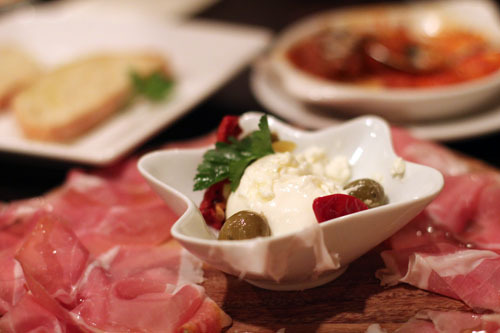 We ordered a burrata appetizer that was served with the tastiest prosciutto we’ve ever had. Top the burrata and the prosciutto on their garlic-rubbed country bread and you are transported momentarily to heaven. Oh wait, we’re in Santa Barbara, so we’re already in heaven. But you get my drift. The girls couldn’t get enough meatballs, so it was a bummer that you only got three with the appetizer. But they were three thoroughly-enjoyed meatballs. The pizzas are great. Awesome crust and lots of great flavors. 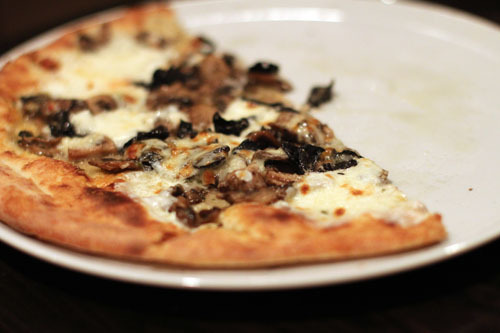 There’s a lot of pizza in the world, and theirs holds its own. Of course I had to try their cannoli…it was, well, interesting. Different than any cannoli I’ve ever had. SUPER creamy, I wouldn’t have believe it was ricotta if I hadn’t read it on the menu. And not very sweet, which was also a surprise. It was yummy, but you have to eat it not expecting a traditional cannoli. The restauarant was family-friendly – there were other kids there and I felt that my kids were welcome. However, there is no kids’ menu and no crayons. And service, while super friendly and helpful, was slow. Dinner and dessert took two hours. Kind of long for the girls, but they did surprisingly well. 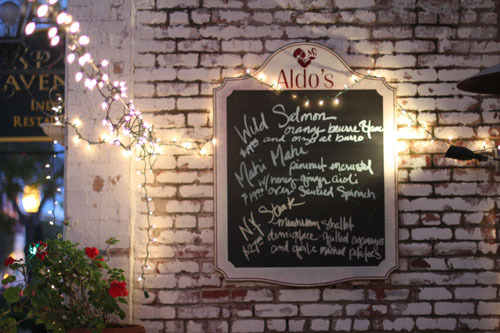 On our second night, another popular spot Aldo’s Fine Italian Restaurant treated us to dinner. The restaurant has all the traditional Italian dishes you would expect, plus a few fun dishes like a pork chop cooked in a dried cherry sauce that sounded really good. I ordered the baked scallops cooked in a light cream sauce with mushrooms, tomatoes and spinach, as recommended by the waitress. She was right – the dish was delicious. Surprisingly light given it is baked in cream, and the vegetables were cooked perfectly, nice and fresh-tasting. My favorite aspect of the food was the sauces. The mushroom and artichoke appetizer was in a delicious white wine sauce, the sauce on my scallops was wonderful, and the mushroom sauce on Nate’s steak was also super tasty. Of course I had to try their cannoli, too. I’m a little obsessed. It was more traditional than Olio’s, which I think is a good thing. The owner and I agreed, though – nothing beats a cannoli in the Northeast! All the desserts were quite tasty. Cate gobbled up the chocolate raspberry mousse cake – I could barely get a bite in! Like Olio’s, the restaurant was family-friendly. There was a kids’ menu and crayons available, which is always helpful, and they are willing to do 1/2 portions of most pasta dishes if your child feels more adventurous. I appreciate that. The waitstaff was super nice and helpful, but slow (like Olio’s). Long dinners can be really fun and nice, but with kids it is sometimes hard. Cate loved our waitress and talked about her on the walk home. It was really cute. The owner came to chat with us for a while. He started running the restaurant in December, so it was fun to talk with him about his experience. And, like I always say after talking to people who run restaurants, I really admire their hard work and can’t imagine doing it myself! Today we’re going to go see the Santa Barbara Mission, drive around and look at big houses, and visit the Wine Cask for lunch. Then we’re off to Huntington Beach! Today I’m not making breakfast for dinner like I had originally planned. 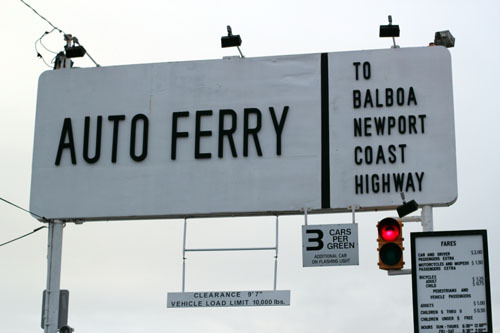 Instead we are doing something so much better – driving to Santa Barbara! Tonight we will be eating at Olio Pizzeria, which I’m certain will be better than pancakes. After spending a few days in Santa Barbara we will head down to Orange County. We are SO excited for this trip and will be sharing it with you as we go, especially since we have some great meals lined up! Here’s our menu for the week – gotta love vacation! 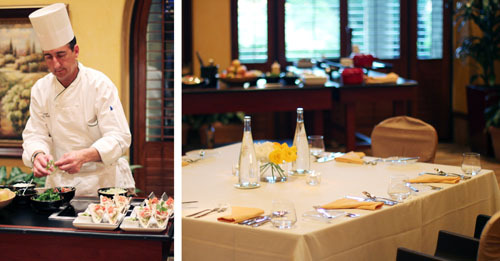 – Dinner at the Hyatt Regency Huntington Beach, with a special tour of the kitchen with the chef! – Huntington Beach Day…any suggestions? 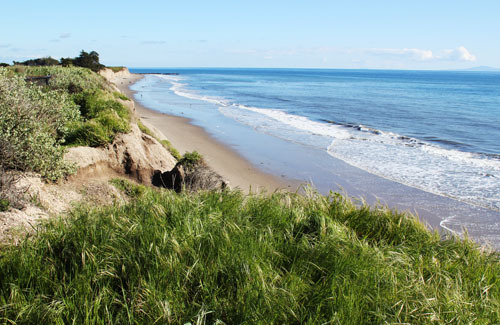 – Newport Beach Day…any suggestions? – Lunch at Cafe Orleans in Disneyland! – Breakfast for dinner, for real this time…we’ll be home and I’m sure exhausted! I’m thinking pancakes will fit the bill. Since I’m not offering any helpful dinner ideas this week, I’m counting on all of you to share your menus and inspire one another! 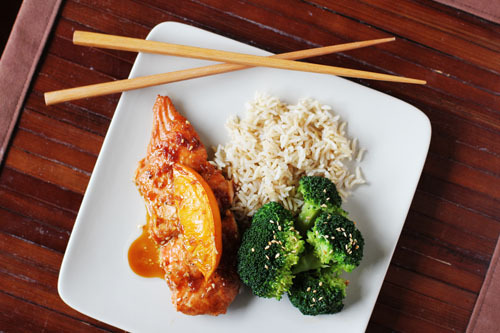 Doesn’t this look delicious? It is. 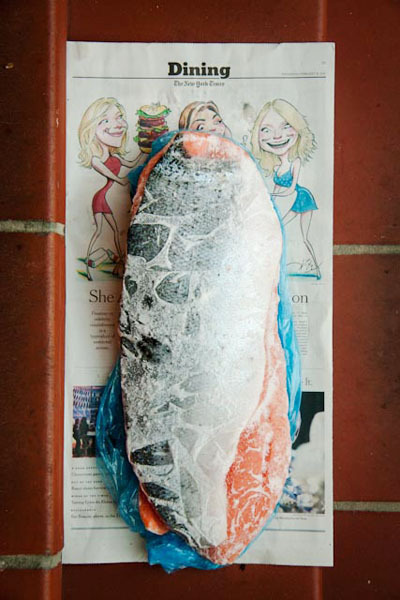 A few of us in the Martha Stewart Circle of Bloggers received a salmon from Norwegian Salmon for some cooking fun. Not just some salmon. A salmon. As in the ENTIRE salmon. Here she is. This photo was taken by Nikki’s talented step-father Galen Lowe. Thanks, Galen! I knew it was coming, but it was still something to behold when I opened the package! Our family hardly ever eats or cooks fish, so you can definitely call me a fish novice. I do enjoy salmon and decided it would be fun to participate. I think I’ve only ever made salmon twice in my life, so I didn’t have a bunch of recipes in my box to turn to. 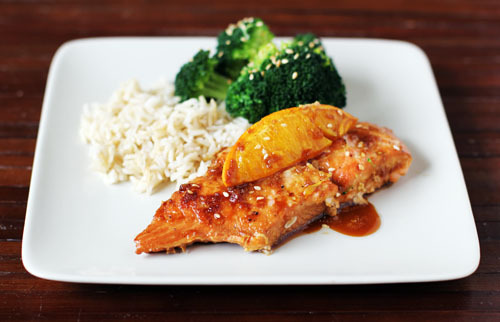 Norwegian Salmon has a great website with all kind of quick and easy recipes, as well as some very helpful how-to videos. I decided I may as well take advantage of their expertise and use one of their recipes. 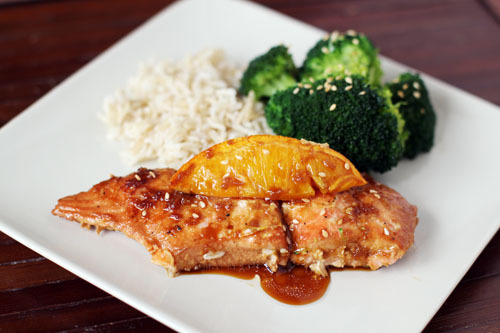 I settled on the Asian-Style Orange Sauced Salmon with Sesame Broccoli, which was categorized under the Easy category. My friend Nikki and I made the dish together. Nikki loves salmon, so I had to share the catch with her. You certainly do not need two people to make this recipe, although it was fun hanging out! The recipe was super easy to prepare, and the salmon was delicious. Bake for 12–15 minutes or until salmon is pink in center. I have been wanting to do a post about knives since I started this blog, but it just hasn’t happened. I even took photos at one point…photos that have since been relegated to the trash bin. But, today is the day! The post is happening! Let’s talk knives! 1. What knives do you need? Well, you only need THREE knives. That’s right, three. A paring knife (or other small knife that you are comfortable with), a chef’s knife (larger, multi-purpose) and a long serrated knife. If you have that, you’re all set. Of course, there are lots of other great knives out there that I’m sure are perfectly loveable. But if we’re talking need, these three will do it. For Christmas years ago Nate bought me three Wusthof knives – a 3″ paring knife with hollow edge, a 6 1/2″ santoku knife with hollow edge, and a super slicer (serrated). They’ve been perfect. I’ve never felt a need to buy anything more. I use the serrated slicer only for bread and slicing cooked meat. My paring and chef’s knives take care of the rest. Quick note on the chef’s knife. We originally bought a Japanese santoku knife, which has a flat edge. 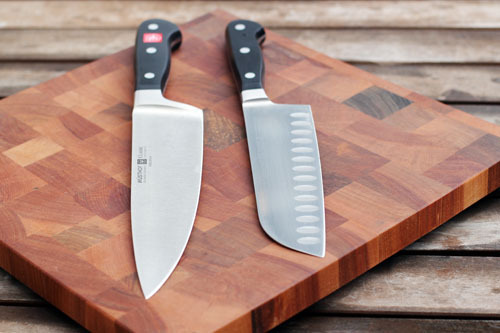 Wusthof recently sent me an 8″ cook’s knife with their new PEtec edge to try out. This new knife has the classic shape, where the blade curves up towards the end. I honestly can’t tell you which I like better. (See the two knives in the picture below, side by side.) The classic shape is definitely nicer when chopping herbs, but other than that, I like both shapes. The best thing to do is to try them out and see what feels good in your hand. I think I do like the smaller 6 1/2″ size as opposed to 8″, but that might be just because that’s what I’ve used for so long and it’s what I’m used to. For the paring knife, I do wish that mine had the classic shape, instead of the santoku flat shape. It’s just so small that the flat edge doesn’t work for me as well. That said, I still love my paring knife and have done just fine using it over the years. 2. Invest in high-quality knives. 3. Hone your knife every time you use it. Yes, every time. Honing realigns the edge of the knife and will keep your knife sharper longer.The video below from Fine Cooking is a great tutorial on honing. 4. Have your knives professionally sharpened. Not much else to say here. If you’re honing at each use, you won’t have to sharpen them very often, probably once a year or so. Sharpening is different than honing and actually grinds the metal to get your edge back to a sharp state. There are plenty of sharpening tools out there, and my friend who is a chef has equipment to sharpen her own knives. But unless you really know what you’re doing, I would go to a professional. 5. Take care of your knives. Store them properly. I store mine on the wall with a magnetic wall holder, but a block (either on the counter or in your drawer) is a great option. Bottom line – you want them stationary and not touching one another. And you want them safely stored so no one gets hurt! Don’t put your beautiful knives in the dishwasher! It’s not that hard to hand wash them, so just do it. Don’t cut bones with your knives. Unless you buy a knife specifically for that purpose, the bones will damage the blade. 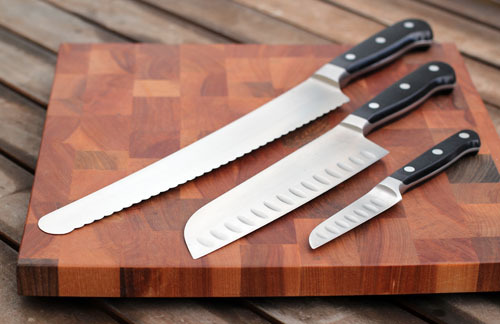 Don’t cut on glass – plates, cutting boards, whatever. I get the chills just thinking about it! I think that’s it! This post has been bumping around inside my brain for years, so I’m hoping I remembered everything! Feel free to share your own thoughts and suggestions, or tell us about the knives you use and love! Crisco has a 64-oz bottle of canola oil that I love. It’s not the oil that I love, although the oil is fine. Nevertheless, I do love this bottle of oil. 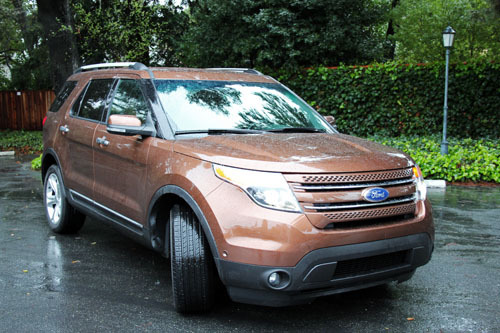 And I just bought my second one this week without even looking at the price or comparing to other brands. So, why do I love this bottle of oil so much? The “Simple Measures” cap and spout are ingenius. It’s like a laundry soap bottle, where the oil that drips off the cap goes back into the bottle, instead of all over the outside, thereby avoiding that oily, disgusting mess you usually find on a bottle of oil. The cap itself has measurements on the side, which is also helpful…but really, it’s the construction of the cap and spout that makes my heart go all a-flutter. Crisco has been making this bottle for a while. No real news here. And I have no connection to Crisco whatsoever. This is just a simple declaration of love…yes, for an oil bottle. Happy day-after-Valentine’s Day! I bought English muffins recently and Cate has become obsessed. She would eat a whole package every morning if we let her. 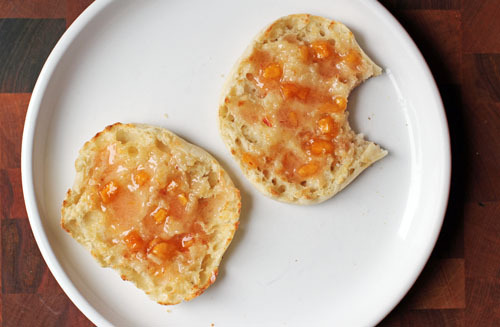 Is it the English muffin itself or perhaps the butter and homemade jam filling the nooks and crannies? Can’t say I blame her. Another week, another menu. I can’t believe how fast time is racing by! – Happy Valentine’s Day! Mac & Cheese for the girls while Nate takes me out for dinner and a movie. He did good this year – he lined the babysitter up weeks ago. What a guy! – Homemade hamburgers…it’s been a LONG time since we’ve made these and it sounds good to me this week! 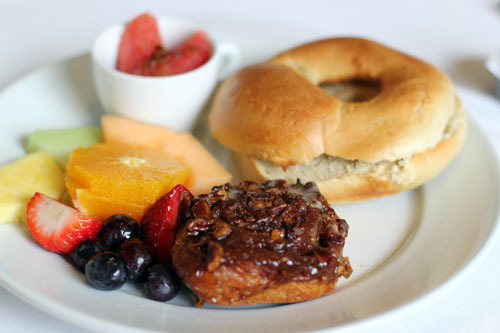 – Breakfast for dinner – perhaps baked french toast – yum! 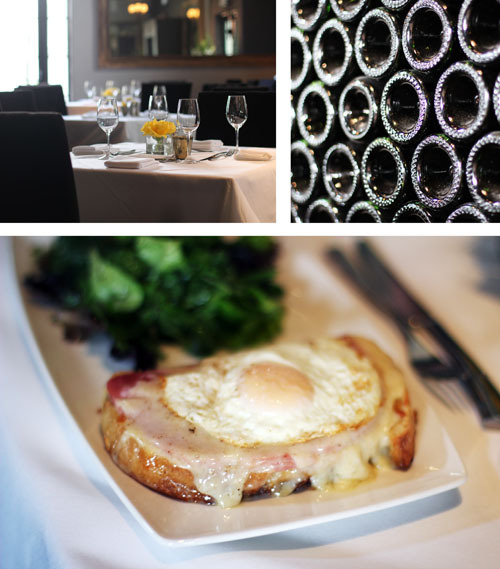 Can’t wait to see your lovely menus for the week…and any yummy Valentine’s Day treats you have planned!